The world’s largest mobile gaming developers – such as King and Supercell, both with company valuations in the billions of dollars — have created massively profitable franchises, proving that single titles can generate hundreds of millions or even billions of dollars in yearly revenues. But to justify high valuations and inspire confidence in public markets, free-to-play mobile game developers need to not only consistently develop hits but manage portfolios of concurrent hits. Supercell’s recently released financial report for 2013 revealed that the company generated $464MM in EBITDA for the year, or about $200MM less than EA’s operating cash flows for the fiscal year. At the time of this writing, however, EA has a market capitalization of $8.54BN, which is almost 13x FY2013 operating cash flows; Supercell, on the other hand, received its $1.5BN investment from SoftBank at an EBITDA multiple of 6.5x. That EA and Supercell have wildly different valuations (EA’s in the form of market capitalization, Supercell’s in the form of the price SoftBank was willing to pay for 51% of the company) is not surprising: EA is a massive company employing 9,000 people worldwide and Supercell is a comparatively tiny operation of approximately 140 employees. The curious difference between the companies is the significant distance between their multiples, the crux of which is diversification. As of its last annual report, EA published games through five “labels” for consoles, the PC, tablets, mobile devices, and the internet. Supercell, by contrast, operated two mobile / tablet games in 2013. If any of EA’s income streams were to precipitously evaporate, the overall impact on the company would be muted; the same is not true for Supercell, or any game developer managing only a handful of titles. 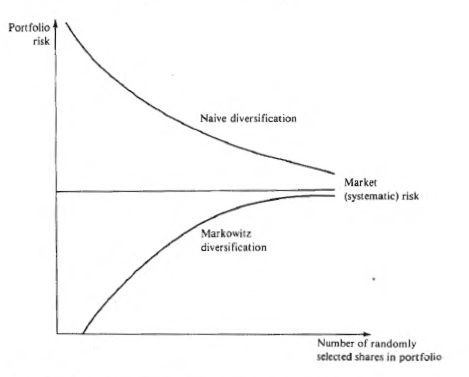 Diversification is at the heart of Modern Portfolio Theory, a concept first introduced in a 1952 paper by Harry Markowitz and for which he, Merton Miller, and Harry Sharpe jointly won the Nobel Prize in economics in 1990. The central thesis of Modern Portfolio Theory is that the risk of a portfolio of assets is dependent not only on the variance of the returns of the individual assets but on the correlation between the returns of the assets in the portfolio. In other words, since the averaged risk of individual assets in a portfolio is different than the risk of a combination of assets, the measure of how the returns on assets in a portfolio move together (called covariance) influences the overall risk of the portfolio. But simply operating a portfolio of games doesn’t alone limit risk; Modern Portfolio Theory states that the covariance of returns of assets in a portfolio influences the overall risk level of the portfolio. It’s therefore not sufficient for a gaming company to diversify its revenue base; it needs to also ensure that the revenues from titles in its portfolio don’t move together. But the broader discussion of appropriate risk balancing in a mobile gaming portfolio begs the question: what is risk for a mobile game? In Modern Portfolio Theory, Francis and Kim define risk as “dispersion of outcomes around the expected value”; within the context of Modern Portfolio Theory, this can be taken to mean the “spread” of returns around the average. This is generally described with the descriptive statistics variance (σ2) and standard deviation (σ), variance being the sum of squared differences from the mean of a set of values, and standard deviation being the square root of variance. The return values on the X axis of this diagram are rates of return on the stock, and the Y axis represents probabilities of those rates of return being realized. Phase 1 can be thought of as a “ramp up” stage, phase 2 as a “decline” stage, and phase 3 as a “stable operations” stage. Creating a probability distribution of historical revenue values for a game like the one illustrated above wouldn’t make sense because revenue is highly dependent on the “phase” the game is in. In any case, risk, at the level of a phase within a game’s lifecycle, can be thought of as the dispersion of revenue values around that phase’s mean. The revenue of a game might be impacted by a general shift in consumer sentiment away from aspects of its core mechanics or aesthetic, such as theme (eg. pirates) or genre (eg. city builder). As a result, the revenues of two games being operated concurrently might experience covariance (ie. change together) if the games are similar enough that broad shifts in consumer sentiment would affect them both. Appealing to contemporary consumer taste is incumbent on any developer. The most obvious way to diversify against “taste” risk would be to build a broad portfolio serving a huge number of game genre and theme combinations to match the overall mobile gaming landscape in a process known as naive diversification. Building such a portfolio of games would reduce the risk level of the portfolio to the general risk level of the market — that is, as a developer’s portfolio approaches the general makeup of the app store (or the total app universe), then macro-level shifts in sentiment affect both in the same way. The competing strategy in this graph, Markowitz diversification, asserts that a portfolio of just two assets can exhibit minimized risk by achieving perfect negative correlation (ie. the asset returns move in opposite directions, indicated by a correlation coefficient of -1). This is more relevant to the construction of a mobile gaming portfolio. The noteworthy result of this specific portfolio balance is that, in all cases of oil price changes, the competing effects on the oil and transportation stocks produce a 2% increase to the value of the portfolio. By diversifying the assets held, the portfolio’s risk owing from fluctuations in the price of oil have been ameliorated (although it’s also worth noting that potential gains have likewise been diminished). Commodity price shifts are far more concrete and immediate than any market shifts that might affect gaming revenues, such as changes in consumer sentiment. But those changes can still occur, and thus diversification can alleviate the risk that such changes radically alter total revenues. In the second scenario, when the developer operates a portfolio of both game genres, either change results in a 10% revenue increase, but the standard deviation of the changes for the portfolio sits between those of the core and puzzle games. As noted, swift, radical swings in consumer taste are not as likely as commodity price swings. 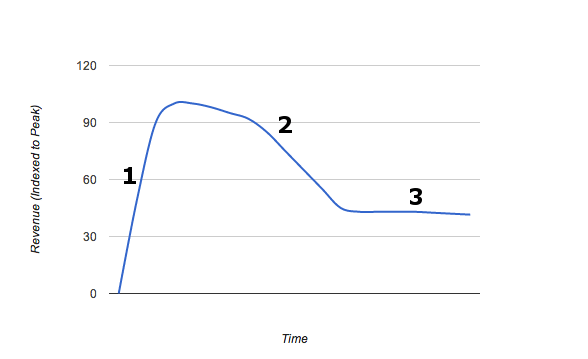 Perhaps more applicable in a consideration of portfolio theory for mobile gaming is the timing of the shift of the phases of a free-to-play game’s lifecycle. This graph depicts two games, launched at the same time and each exhibiting the three-phase lifecycle pattern cited earlier. 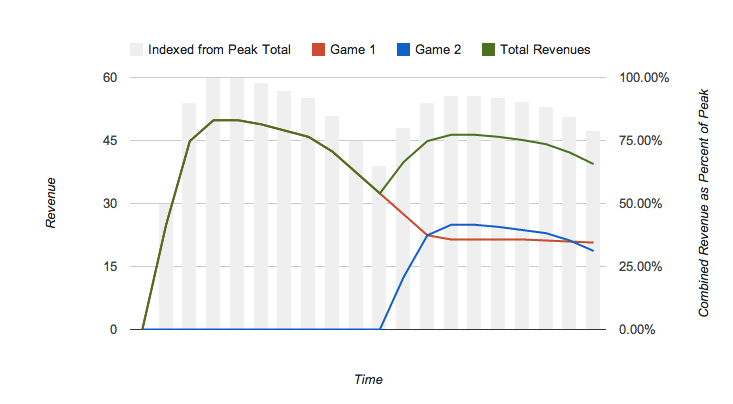 The left Y axis tracks revenues for the line graphs and the right Y axis tracks the grey bar chart, which represents total combined revenue (Game 1 + Game 2) as a percentage of the peak combined revenue over the life of both games (in other words, how total revenue increases and decreases). 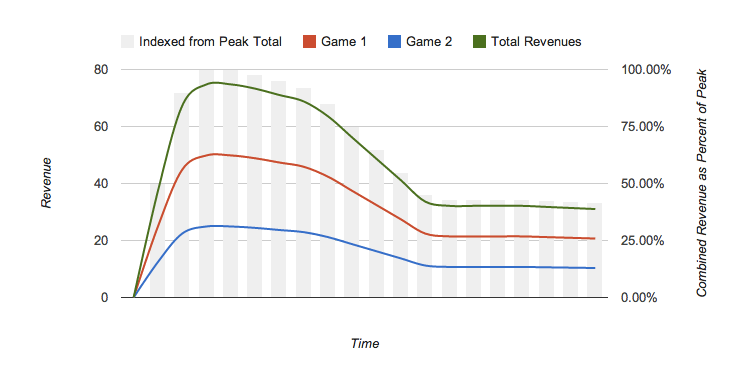 In this scenario, the combined revenue of both games ramps up quickly and then declines to less than half of its peak. Such an irregular revenue schedule is “risky”, not just from the standpoint of dispersion around the mean, but for practical purposes: staffing, facilities, marketing, etc. are difficult for a developer to plan when total revenues swing wildly. In the second graph, total revenues don’t reach the same peak level (just under 80 in the first graph vs. just over 45 in the second), but the swings in total revenue from the peak are far smaller (a drop after the first peak to 45% in the first graph vs. a drop after the first peak to 65% in the second graph). The trade-off for stability in the second scenario is, of course, timing: the total revenues from both games are delivered over 1.5 lifecycles vs 1 in the first graph. The difficult questions mobile game developers have historically had to answer in asserting corporate value have always been related to the quality and extremity of hits. First, it was whether hit games could generate massive revenues for the medium-term (1+ years), then it was whether studios could consistently develop hit games, and now it is whether a portfolio of hit games can be managed in such a way that revenues are consistent and somewhat predictable. Modern Portfolio Theory applied to gaming might attempt to mitigate risk — that is, irregularity of returns — across two dimensions: 1) changing consumer tastes and 2) the (generally speaking) rise-and-fall lifecycle of mobile games. 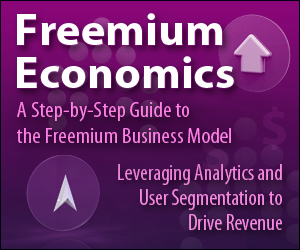 The application of the model is imperfect and not fully fleshed out here, but it’s an important topic to consider as the mobile gaming market continues to evolve.